The Panasonic TY-EW3D2 3D glasses are a stylish and practical addition to a Panasonic 3D TV set. Yet, those good looks are also highly practical. Simply plug into a USB socket on the TV and within 2 hours charging, you're ready for another 30 hours viewing. Panasonic 3D glasses, active shutter, bluetooth RF, rechargeable, TY-ER3D4ME. Condition is Used. Dispatched with Royal Mail 1st Class. In very good condition and hardly used.will require charging lead comes with original packaging and instructions. Panasonic 3D glasses, active shutter, bluetooth RF, rechargeable, TY-ER3D4SE. Condition is Used. Dispatched with Royal Mail 1st Class.in excellent condition and hardly used.complete with original packaging and instructions but will need charging lead. Panasonic 3D Glasses, 3D Eyewear TY-EW3D2ME good Condition Boxed. The glasses are in good condition. Plastic case. Panasonic 3D glasses, active shutter, bluetooth RF, rechargeable, TY-ER3D4ME. Condition is Used. Dispatched with Royal Mail 1st Class. Great working condition. Manual & Charging lead included. Box isn’t in the best condition. Panasonic Active 3D Glasses TY-ER3D4MA. Condition is Used. Dispatched with Royal Mail 1st Class. Great working condition. Panasonic Active 3D Glasses TY-ER3D4MA. Condition is new. These glasses have never been used. Still have the plastic seal over the batterie cover. Please see photos. Genuine Panasonic TY-ER3D5MA 3D Active Shutter Glasses Bluetooth for Viera TV. Great condition, used few times. A pair of Panasonic TY-EW3D2MA RF Active 3D glasses.These require pairing with your compatible Panasonic 3D TV via RF. Panasonic 3D Glasses TY-EW3D2MA New/Un-used TV Full HD IR Active Shutter Specs These are in a great as new condition, the contents are still sealed, glasses have been opened but not been used. Any questions, please ask. 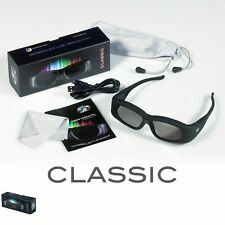 Panasonic active shutter 3D glasses Model no TY-EW3D2M Rarely used, purchased for use with a Tv we have now replaced.. Excellent condition with case & cable..
Been sitting around gathering dust , never used Panasonic TV Blu Ray Active 3D Glasses TY-EW3D10 Dispatched with Royal Mail 1st Class. 3D Glasses compatible with Panasonic Viera Full HD 3D TV. The Panasonic TY-EW3D10 active-shutter glasses are battery operated, wireless, and lightweight. Instead, they use a CR2032 battery that is common in small electronic devices, such as calculators. Panasonic 3D glasses. Require CR2025 battery ( new battery fitted ). 2 pairs of Panasonic Active shutter 3D glasses. These are 3D Glasses for the Panasonic Viera TX-P50GT30B TV family 1 x Panasonic RED TY-EW3D2S small size. In original Grey plastic cases with Panasonic Manual and a. Glasses are in very good condition. Tabs are still in place for the battery and have not been removed. Body and lenses have marks but no scratches and nothing that would hinder use. * 3 Pairs * 1 rechargeable * battery powered please check the pictures for compatibilty description. A pair of active 3D glasses originally used with a Panasonic plasma TV. Supplied with protective box and charging cable. This creates a pair of your very own prescription 3D glasses. • 1 Pair of Active Shutter 3D Glasses. Our 3D3 Universal 3D Glasses use active shutter technology for optimum picture quality. Coupled with our custom-built firmware, this clever combination results in the very best 3D experience. Panasonic 3D glasses TY-ER3D4MA 2 pairs. Panasonic 3D glasses TY-ER3D4MA 2 pairs. one pair has been used to test, the other has never been opened. Having an Easter weekend clear out, any questions please ask. There are differences in the viewing range of the 3D eyewear among individuals. Viewing range: transmitter for 3D eyewear / within 3.2m from front surface (within 35-degree horizontal, 20-degree vertical). • Active Shutter Technology. These 5th generation glasses have an RF (wireless) Bluetooth system built in. This enhances stability for high-quality 3D viewing. 1 Pair of Panasonic 3D Glasses. Compatible 3D Glasses. 1 Pair of A1111 3D3 IR and RF Universal 3D Glasses. 1 Pair of 3D3 A1111 3D Glasses. Our 3D3 Universal 3D Glasses use active shutter technology for optimum picture quality. Coupled with our custom-built firmware, this clever combination results in the very best 3D experience. Panasonic 3D glasses. Good condition and boxed. Glasses only, no accessories. Panasonic TY-ER3D4MA Active 3D Glasses. Condition is Used. Dispatched with Royal Mail 1st Class. Comes with box. 3D Glasses -. Viewing Range Transmitter for 3D Eyewear. Within 3.2 m (10"5") from front surface (Within 35-degree horizontal, 20-degree vertical). Weight. 085 lbs. Weight (including batteries) 39 g (1.4 ozs.). This part is 100% Genuine from Panasonic. 2 pairs of Panasonic 3d glasses one pair never been used. • Hisense H75M7900 TV Compatible Glasses. This creates a pair of your very own prescription 3D glasses. Compatible 3D Glasses. Our 3D3 Universal 3D Glasses use active shutter technology for optimum picture quality. Boxes may have been opened for viewing. or item number where possible. Compatible with Panasonic 3D TVs or Projectors using IR protocol for connection. Compatible 3D Glasses. 1 Pair of Panasonic 3D Glasses. Compatible Panasonic Projectors Freeview HD. Freesat HD. • 3D Eyewear case included. 2 Pairs Panasonic 3D Glasses Active Rechargeable Genuine . Condition is Used. Dispatched with Royal Mail 2nd Class. Karcher Machines & Parts. Genuine Spare Part. Health & Beauty. Water Jugs & Filters. Washing Machines & Parts. Vacuum Parts. Vacuum Cleaners. Vacuum Bags & Filters. For sale original Panasonic TY-EW3D2SE 3D glasses in perfect condition, almost as good as new. Since it is Bluetooth communication, keep an eye on the screen and 3D images are not disturbed. Light and comfortable function is also enhanced. Abraham Lincoln Vampire Hunter. LG 47LX6500-TD. The Amazing Spiderman. NOT COMPATIBLE AS BELOW IN RED. TXP50VT30E HP ENVY LAPTOP. Step Up Revolution (aka: Step Up 4). Resident Evil: Retribution (aka: Resident Evil 5). Full HD 3D glass active shutter type 3D glass. Corresponding model (TV made by Panasonic). 3D glass of Bluetooth communication. Mass (approx) 34 g. 85 AX 900 / AX 800 / AX 800 F series. WT600 / VT60 / GT60 series.